Cannon Michael is the president of Bowles Farming Company. During times of water scarcity, like California’s recent drought, it’s tempting to take on a binary view of the world. This was definitely the case with agriculture, which appeared to be at odds with everyone: farms vs. fish, farm vs. cities, farms vs. regulators. As a dominant water user in the state, they were easy targets. But when one digs deeper, it’s obvious that many in the agricultural community want to move beyond this debate and do things differently. Yes growing food and fiber takes water, but there are plenty of farmers laser-focused on improving efficiency, maximizing multi-benefit solutions and striking a balance between growing crops and preserving the environment. 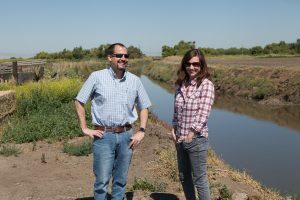 I recently visited with Cannon Michael, president of Bowles Farming Company, which oversees an 11,000-acre farm near Los Banos in California’s San Joaquin Valley. He is the great, great, great grandson of Henry Miller, “the Cattle King of California,” so farming is in his blood. 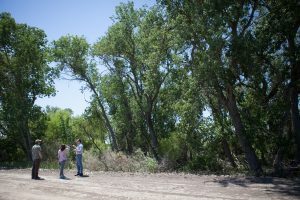 He has senior water rights, and while he still had to make difficult management decisions during the drought, he ended up with more water than many of his neighbors and found ways to share it, a tremendous display of collaboration in the farming community. Now Cannon is working with Environmental Defense Fund (EDF) to create a plan to enhance agriculture and wildlife benefits on his property and serve as a model for others. Below, he shares his thoughts. Your family has a long and storied history in California agriculture. Did you always know you would follow the family tradition? I’m the 6th generation of my family to work in California agriculture. But it wasn’t always the career path I was planning on. I was born and raised in the San Francisco Bay Area and I often visited the farm as a young boy. I have vivid memories of driving out to the country, opening the car door and running for miles – the freedom was amazing. In high school I worked every summer on the farm and enjoyed learning to irrigate, drive tractors and the value of a hard day’s work. I graduated from UC Berkeley and started down a different career path, but eventually I found my way back to the country. Agriculture is in my blood, and I was destined to be a farmer. 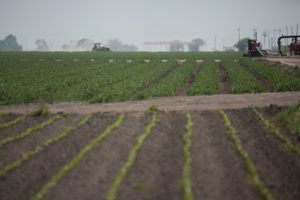 Cannon manages an 11,000-acre farm near Los Banos in California’s San Joaquin Valley. How have you adjusted to less water availability? We were pretty proactive over a decade ago and installed drip irrigation. To be frank, this wasn’t done over water concerns alone; we saw it as an opportunity to increase yield and improve the quality of our products, especially tomatoes. During the recent drought, we were able to leverage drip irrigation and continue to grow our operations. It also opened up opportunities for us to strategically fallow some ground and transfer water to some of our neighbors who had no supply at all. To what degree do sustainability and conservation factor in to the management decisions you make on the farm? What drives your conservation ethic? Farmers inherently know what sustainability is. We must be sustainable if we want to continue to grow good products and stay in business. I don’t see any farmer intentionally wanting to do things that impact their workers, the surrounding environment that they live in or their end consumers. That isn’t a good or logical strategy. That’s not to say that farmers can’t be doing more. There’s a learning piece to sustainability. I may be able to grow a great crop of tomatoes, but I didn’t know what it took to successfully restore habitat areas on the farm. My core strength isn’t being a biologist or a habitat restoration expert. That’s why it’s nice to have partners, like EDF, and the opportunities presented through the Central Valley Habitat Exchange. That way I can make sustainable, holistic management decisions that benefit my farm and the surrounding environment. What type of conservation practices or restoration projects have you implemented on your property? We worked with biologists and habitat restoration specialists to reestablish water fowl habitat and riparian corridors on the property. It really had a profound impact on me when I realized just how much diversity we were supporting. I remember when we got the first bird survey back after we completed the riparian corridor work it said we had 49 different species of bird. Looking at a field of tomatoes, there are variances – but it’s still just a field of tomatoes. So it’s pretty amazing that in the same area there’s also all these species of birds, butterflies and terrestrial species. It adds a richness to the place and brings diversity to the day. I used to find myself looking out of only one side of my truck window at the cropland, but now as I drive, I slow down and focus equally on our habitat. Farmers and environmentalists have often been at odds when it comes to land and water management. Are you hopeful this dynamic can change? I think the dynamic is changing because the agricultural community and environmentalists are finding a lot of overlap in our work and shared goals for a healthy environment and reliable water supply. We all recognize the challenges of a limited water supply so everyone is coming to the table to figure out how to cope. It’s important to remember that there are intelligent and motivated people on both sides. The environmental community brings a lot of information and expertise on habitat and riparian restoration. Farmers know how to get projects done, and they know the local context. So there’s a really great synergy happening between the two groups. At the end of the day, we all want a vibrant and healthy environment in California and a reliable and safe food supply. This entry was posted in western water, Wildlife Protection and tagged California agriculture, California drought, central valley habitat exchange, San Joaquin Valley, sustainable groundwater management act, water use. Bookmark the permalink. Both comments and trackbacks are currently closed. This type of collaboration between agricultural and environmental interests is the model for the “Better Way Forward”. Kudos to Cannon and the folks at EDF for their courage and open-mindedness in breaking old barriers and overcoming legacy prejudices. Working together like this is the only way that we are going to make the environment that we have today a better place for all living things that depend on it- humans, fish, birds, and terrestrial critters. Thank you, Les! You put it perfectly. Kudos to Bowles Farming. It is more than breaking down barriers. It is an opportunity for the next generation of farming to embark without barriers at all. A paradigm shift is underway. Thank you Cannon!